As the start of the new season draws closer, we’re giving you a sneak peek into some of the delights of the 2016-2017 spread. The CAP UCLA Fellows Program is dedicated to celebrating masters of their craft through multi-year presentation commitments. We hope you join us in our celebration! New York-based SITI Company, co-founded by acclaimed American theater and opera director Anne Bogart with Leon Ingulsrud and Ellen Lauren is known worldwide as a constantly evolving collective of artists whose collaborative spirit results in the creation of new theater that straddles performing arts disciplines and challenges norms. The Center will work closely with Anne Bogart and other members of the company to explore projects, educational programs and performances unique to our campus and immediate community. In this 2016-2017 season we are delighted to team up with the Los Angeles Chamber Orchestra to present Kurt Weill and Maxwell Anderson’s Lost in the Stars featuring SITI Company, with direction from Anne Bogart and musical direction from Jeffrey Kahane. An adaptation of Alan Paton’s novel Cry, the Beloved Country, this 1949 Broadway musical was the last score Kurt Weill wrote for the stage before his passing. In the 2015-2016 season we presented Steel Hammer, a collaboration among SITI Company, Pulitzer Prize-winning composer Julia Wolfe and esteemed music collective Bang on A Can All-Stars. SITI Company thrilled CAP UCLA audiences in the 2014-2015 season with their adventurous collaboration with the Bill T. Jones/Arnie Zane Dance Company for the dance-theater work A Rite, inspired by Stravinsky’s iconic Rite of Spring. Robert Wilson is among the most important visual and theater artists in the world. His work uses different artistic techniques integrating movement, dance, painting, light, design, sculpture, music and drama. In our 2016-2017 season, we will feature a Mikhail Baryshnikov and Robert Wilson collaboration—their second for CAP UCLA. Letter to a Man is based on autobiographical texts by Vaslav Nijinsky (1889-1950), one of the most celebrated dancers and choreographers of his time who danced in Diaghilev’s Ballets Russes and created seminal choreographies himself. His diaries, written in less than six weeks in 1919, document the young man’s descent into madness. They were first published in 1936. We presented another collaboration of Wilson and Baryshnikov in the 2014-2015 season. Developed with, and starring, the legendary Baryshnikov, and co-starring Oscar-nominated actor Willem Dafoe, The Old Woman is an adaptation of the eponymous work by recently rediscovered Russian avant-garde author Daniil Kharms. A brilliant, obscure and slyly political novella from the 1930s, The Old Woman loosely follows the story of a struggling writer who cannot find peace with himself. In our 2013-2014 season, we featured a solo act from Wilson. As an homage to revolutionary composer John Cage, Robert Wilson performed Cage’s Lecture on Nothing, one of the central texts of twentieth-century experimental literature. The production has been described as being an “acoustically and visually inspiring approach to the philosophical and poetic text” which Cage based on a complex time length scheme similar to some of his music. Through our Artist Fellow initiative, we celebrate Kronos Quartet as one of the most influential contemporary ensembles of our time and a driving force in the performing arts. For 40 years, the Grammy-winning Kronos Quartet has redefined the string quartet experience through thousands of concerts, more than 50 recordings, collaborations with composers and performers from around the globe, and more than 800 commissioned works. CAP UCLA is delighted to present a new multimedia work featuring the Kronos Quartet for the 2016-2017 season entitled Beyond Zero, which commemorates the centennial of the outbreak of the First World War. Dubbed “the war to end all wars” World War I ushered in a century of conflict that continues into this millennium. 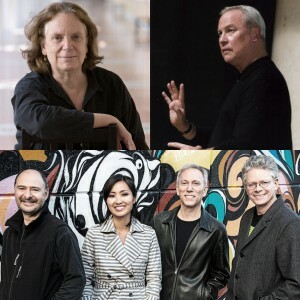 Kronos Quartet will perform compositions by influential composer Aleksandra Vrebalov, and in conjunction with films and archival footage from filmmaker Bill Morrison. The Beyond Zero event will feature performances of works co-commissioned by CAP UCLA for the Kronos Quartet/Kronos Performing Arts Association initiative Fifty for the Future: The Kronos Learning Repertoire. Beginning in the 2015-2016 season, Fifty for the Future commissioned 50 new works – 10 per year for five years – devoted to contemporary approaches to the quartet and designed expressly for the training of students and emerging professionals. The works are being created by an eclectic group of composers – 25 men and 25 women. Kronos will premiere each piece and create companion digital materials, including scores, recordings, and performance notes, which will be distributed online for free. Fifty for the Future will present string quartet music as a living art form. In the 2013-2014 season, CAP UCLA celebrated the longevity and far-reaching influence of Kronos Quartet in a double-performance presentation, which included a special 40th Anniversary concert and the Los Angeles debut of Kronos’ first-ever collaboration with CAP UCLA Fellow Laurie Anderson. CAP UCLA Fellows program is supported in part by the generous support of Susan Bay Nimoy and Leonard Nimoy.